Individualized care, decades of experience… it’s all about YOU! 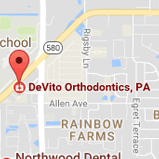 Serving the Clearwater and Tampa, FL communities for more than 30 years, Dr. DeVito has nurtured a wide reputation for precise, personalized, and friendly orthodontic care. Our practice and treatment philosophies have been carefully cultivated to provide the most thoughtful, caring, and efficient service possible. 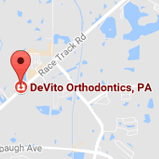 Our practice's top priority is to provide you the highest quality and affordable orthodontic care in a friendly, comfortable environment. We utilize the latest technological advances in the industry, such as invisible ceramic braces and Invisalign®, along with the latest in computer technology (digital imaging and advanced computer graphics) to ensure that you receive the most effective care possible. We hope you will find our family atmosphere and upfront manner to be a breath of fresh air. For more information and your complimentary exam, please contact our Clearwater or Tampa orthodontic offices.